Strength. Stamina. Sophistication. Those are just some of the qualities of the new Moto Turbo -- our most powerful and long-lasting smartphone to date for those in India who want to go an extra mile. Moto Turbo will be available for sale starting now on Flipkart for INR 41,999 for the 64GB Ballistic Nylon variant in India. With a huge battery, the time you save staying unplugged allows you to do more with your device -- from watching videos to playing games to capturing photos and viewing them on the Quad HD display. Combined with the most powerful Qualcomm Snapdragon processor you can get, Moto Turbo gives you the confidence to live life to the max day in and day out. 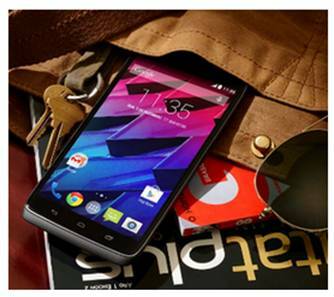 Moto Turbo is designed to outperform your expectations with the newest and most powerful features. Use the 21-megapixel camera to capture stunning pictures and movie-quality 4K video, and play it back on the 5.2-inch Quad HD (1440p) display featuring 80% more detail than 1080p. If fact, it’s the sharpest display of any smartphone with an incredibly high pixel density of 565 ppi. The newest and most powerful Qualcomm® Snapdragon™ quad core processor gives you all the performance you need. Plus, you get a huge 64GB of storage, perfect for your collections of music, movies, books and games. On the outside, Moto Turbo is designed with premium ballistic nylon, a first for the industry. It’s a high-quality, durable material with a distinctive texture - you might recognize it from outdoor gear, like backpacks. Under that, is a layer of DuPont Kevlar® fiber, a material that is five times stronger than steel. Moto Turbo was also designed with a water-repellent coating to protect from the inside out. It guards against everyday spills and even an unexpected downpour. You’ll get a pure Android experience, which means running the latest version of the Android OS without annoying bloatware or software skins that slow you down. Moto Turbo also incorporates the same Moto software experiences that are available on the new Moto X. So you can interact with your Moto Turbo more naturally, using the same voice commands, and your Moto Turbo will learn your preferences and adapt to you, making it even easier to use. * All battery life claims are estimates, and are based on a standard mixed use profile for Motorola devices on a high-quality 3G network in an urban area. The mixed use profile includes several activities such as voice calling, internet browsing, among others, as well as standby time. Actual battery performance will vary and depends on many factors including signal strength, network configuration, age of battery, operating temperature, features selected, device settings, and voice, data, and other application usage patterns. Perspective | How effective are innovations in the OOH medium..?